It hasn't been cheap. The couple, both lawyers in their mid-50s, will shell out more than $320,000 between them over a decade. For that, they will be able to tap into benefits topping $1 million apiece by the time they are in their 80s, the age when many Americans suffer from dementia or other illnesses that require full-time care. 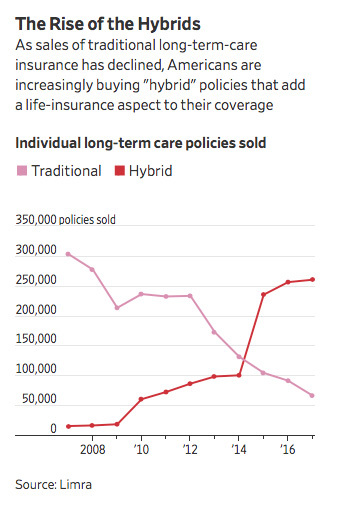 Such policies that combine long-term-care coverage with a potential life-insurance benefit are called "hybrids," and they are reshaping the long-term-care niche of the U.S. insurance industry just as it had appeared headed for obsolescence, financial advisers say. The Goldsmiths were among 260,000 purchasers last year nationwide of these hybrids, according to industry-funded research firm Limra, far outpacing the 66,000 traditional long-term-care policies sold in 2017. Now, many insurers are finding their best sales opportunity with wealthy Americans. Many of these people may be able to afford costly care later in their lives, but they are buying the contracts to protect large estates, advisers say. "What felt like a good nest egg" can be hit by "astronomical expenses," says Ms. Goldsmith, of Westchester County outside New York City. Their policies are from a unit of Nationwide Mutual Insurance Co.
Hybrids can cost even more than traditional standalone products because they typically include extra features. There is wide variation across the hybrid category and the type the Goldsmiths bought (known as "asset-based long-term-care") includes a particularly valuable feature: a guarantee that premium rates won't increase. Traditional long-term care policies fell from favor in the mid-2000s after many insurers obtained approval from state regulators for steep rate increases—some totaling more than 100%—due to serious pricing errors. In May, Massachusetts Mutual Life Insurance Co. began applying for average increases of about 77% that would apply to about 54,000 of its 72,000 LTC policyholders. Until this move, MassMutual hadn't previously asked longtime policyholders to kick in more to better cover expected payouts. Besides the death benefit—which is as much as $432,000 on a combined basis for the Goldsmiths—hybrids also include a "return of premium" feature. This allows buyers to recoup much of their money if they want out of the transaction, albeit without interest. "We call these ‘live, die, change your mind’ policies," says Natalie Karp, the Goldsmiths’ agent and co-founder of Karp Loshak LTC Insurance Solutions, a brokerage in Roslyn, N.Y.
About a dozen insurers still offer traditional long-term-care policies that typically lack those features. They charge more and provide shorter benefit periods than they did in the past. But Tim Cope, a financial adviser in South Burlington, Vt., for insurance brokerage NFP, says the good news is that "policies continue to pay for much-needed care, and changes in their policy design, pricing and underwriting are an effort to minimize premium increases on recently issued and new policies." Ms. Goldsmith says she was attracted to the Nationwide hybrid because it doesn't require submission of receipts to obtain the long-term-care proceeds. Benefits are payable in cash when a physician certifies a severe cognitive impairment or inability to perform basic activities, such as bathing, eating and dressing. Payments are capped at specified monthly amounts. For the Goldsmiths, the monthly benefit starts at $9,000 per spouse and grows with an inflation adjustment to more than $15,000 in their 80s. "Receipts are very hard for older people to deal with, especially when stressed by caring for a disabled spouse or being disabled themselves," Ms. Goldsmith says.